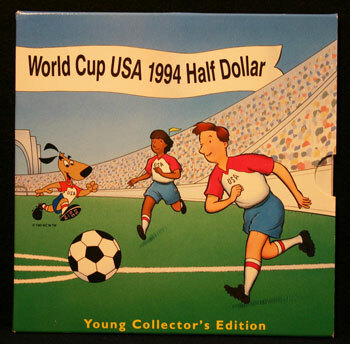 Taking advantage of younger people's interest in sports and soccer, the United States Mint developed Young Collector Edition Coin Sets for the 1994 World Cup Soccer clad half dollar. 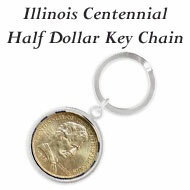 The package remained consistent at six inches by six inches by 1/4 inch with an outer sleeve constructed of card stock printed in color and a folded inner color card stock package that protects the coin and provides information. 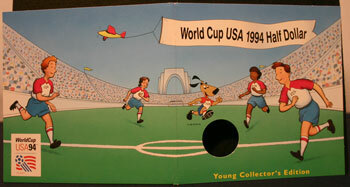 On the front of the package, Jeremiah and Christina play soccer with the 1994 World Cup mascot, Striker. Their dog, Charlie, doesn't appear until the inside of the package. 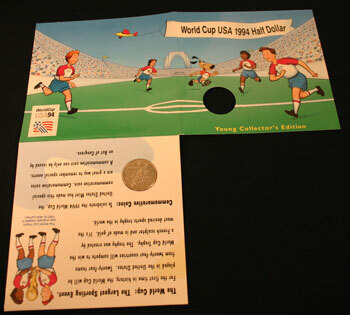 The title of the package states, "World Cup USA 1994 Half Dollar" with "Young Collector's Edition" printed at the bottom. 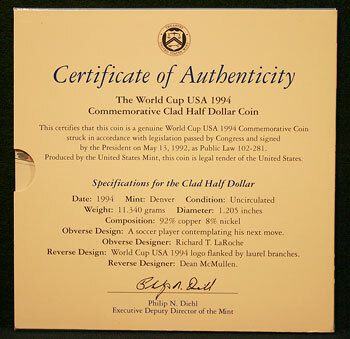 This certifies that this coin is a genuine World Cup USA 1994 Commemorative Coin struck in accordance with legislation passed by Congress and signed by the President May 13, 1992 as Public Law 102-281. 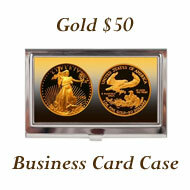 Produced by the United States Mint, this coin is legal tender of the United States. 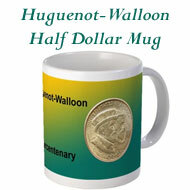 Obverse Design: A soccer player contemplating his next move. Reverse Design: World Cup USA 1994 logo flanked by laurel branches. 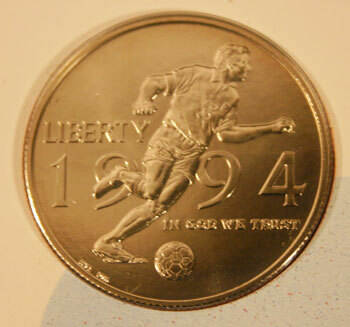 The inner coin package looks like the front of the outer sleeve except the coin replaces the soccer ball. 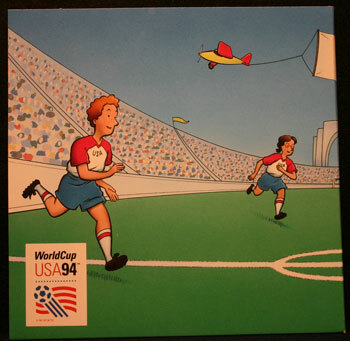 The back of the inner package provides more of the soccer field and the spectators in the stands with the World Cup USA 1994 logo in the lower left. Unfolded, the front and back form the full vignette of the soccer field with players running toward the "ball." Fully unfolded, the remaining section holds the coin and provides information. 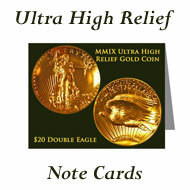 The inside of the unfolded package provides several different message from the US Mint. The World Cup: The Largest Sporting Event. For the first time in history, the World Cup will be played in the United States. Twenty-four teams form twenty-four countries will compete to win the World Cup Trophy. 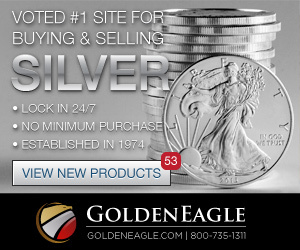 The trophy was created by a French sculptor and is made of gold. It's the most desired sports trophy in the world. 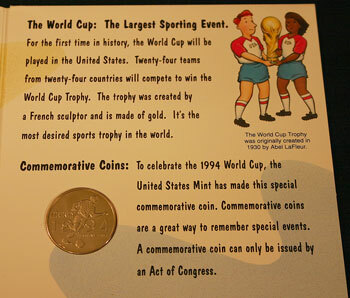 Commemorative Coins: To celebrate the 1994 World Cup, the United States Mint has made this special commemorative coin. 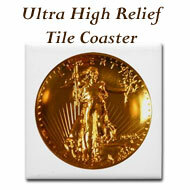 Commemorative coins are a great way to remember special events. 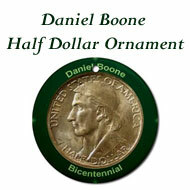 A commemorative coin can only be issued by an Act of Congress. In the upper right corner Jeremiah and Christina hold the trophy with the caption beneath stating, "The World Cup Trophy was originally created in 1930 by Abel LaFleur." 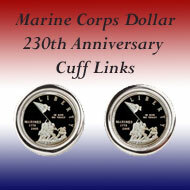 The United States Mint made this commemorative coin. 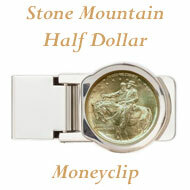 Workers at the Mint handle these coins very carefully and wear gloves so they don't leave marks on the coins. 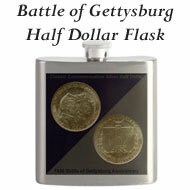 Each coin is put in a plastic case to keep it clean and help protect it from damage. 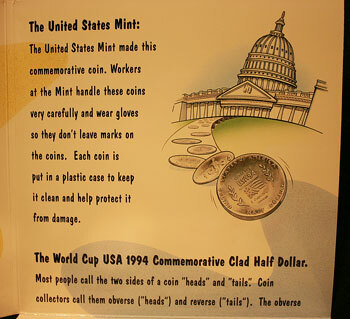 The World Cup USA 1994 Commemorative Clad Half Dollar. shows a soccer player ready to make a big play and with the World Cup for his team. 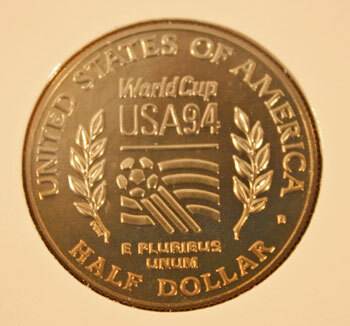 The reverse displays the official World Cup USA 1994 logo. Collecting Coins is Fun: You can learn a lot about your commemorative coin by reading the Certificate of Authenticity on the back of this box. 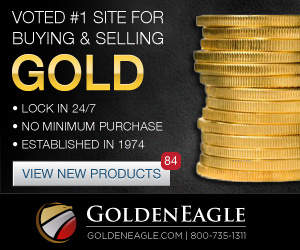 It has all the facts and details about this special coin. 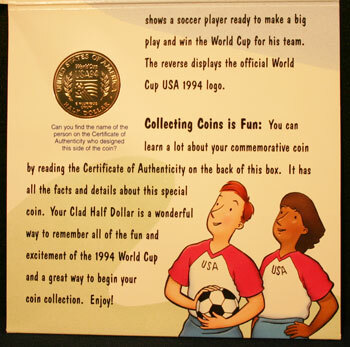 Your Clad Half Dollar is a wonderful way to remember all of the fun and excitement of the 1994 World Cup and a great way to begin you coin collection. Enjoy! 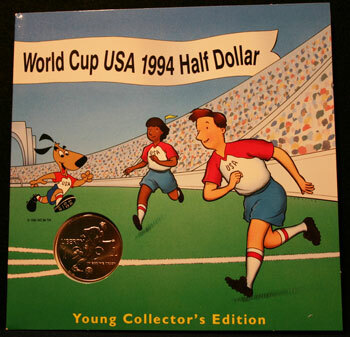 In the lower right corner, Jeremiah and Christina wearing USA soccer shirts look up toward the coin. 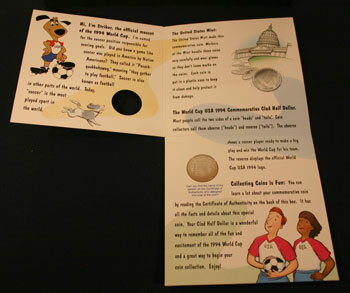 The remaining information section introduces the 1994 World Cup mascot and shows Charlie, the dog, playing at the bottom. 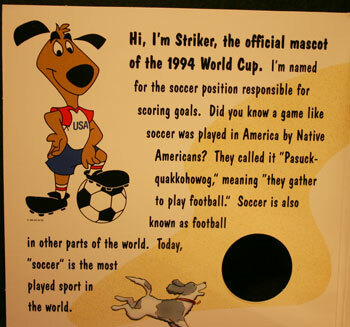 Hi, I'm Striker, the official mascot of the 1994 World Cup. I'm named for the soccer position responsible for scoring goals. Did you know a game like soccer was played in America by Native Americans? They called it "Pasuckquakkohowog," meaning "they gather to play football." Soccer is also known as football in other parts of the world. Today, "soccer" is the most played sport in the world. On the obverse (heads), a soccer player with a "3" on his jersey looks out over the field to determine where to place his kick. 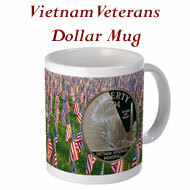 The reverse (tails) shows laurel branches framing either side of the World Cup USA 1994 logo. Doesn't the logo appear to be a soccer ball in motion in front of a stylized flag blowing in the breeze? 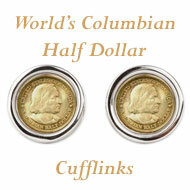 Enjoy learning and collecting these coins whether in the Young Collector Edition coin sets or as a commemorative coin.